TORONTO — Tom Pyatt broke a tie with 3:05 left in the third period and Craig Anderson made 45 saves to help the Ottawa Senators to a 4-3 win against the Toronto Maple Leafs at Air Canada Centre on Wednesday. 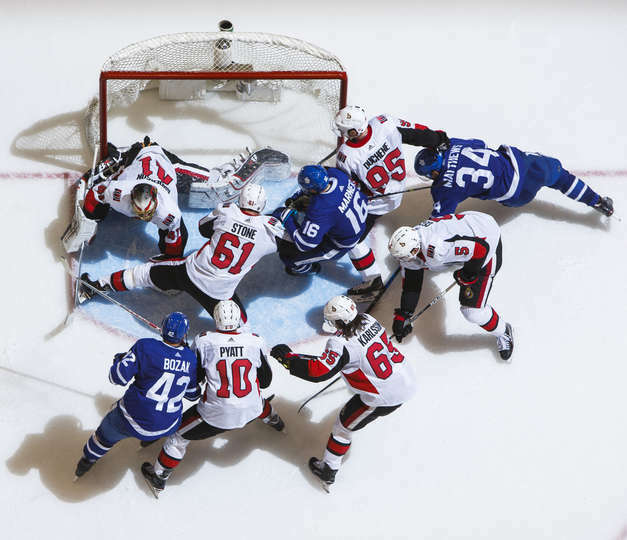 Maple Leafs defenseman Morgan Rielly pinched in at the Ottawa blue line, leading to a 3-on-1 for the Senators. Matt Duchene passed to Pyatt, who skated in alone and shot past goaltender Frederik Andersen’s blocker. Thomas Chabot, Mike Hoffman and Gabriel Dumont scored for the Senators (15-18-9), who have won three of their past four games. Ottawa has won five straight in Toronto for the first time. Senators coach Guy Boucher said he knew immediately after losing 8-2 to the Chicago Blackhawks on Tuesday that he would start Anderson again. Anderson was pulled against the Blackhawks after allowing four goals on 26 shots. Andreas Borgman, James van Riemsdyk and Rielly scored, and Andersen made 28 saves for the Maple Leafs (25-17-3), who are 2-1-1 in their past four games. Dumont scored his first goal in 23 games this season — seven with the Tampa Bay Lightning and 16 with the Senators — for a 3-2 lead at 2:15 of the third period. He got to his own rebound after shooting high over the net and put it past Andersen’s blocker. Rielly tied it 3-3 at 12:28 with a point shot past Anderson’s glove. Borgman made it 2-1 at 18:10 of the second period when his point shot deflected off Duchene and beat Anderson to the glove side. Van Riemsdyk tied it 2-2 54 seconds into the third period when he took a pass from Tyler Bozak, put the puck between his own legs and shot past Anderson. The Senators took a 1-0 lead at 11:26 of the first period when Chabot’s shot from the left circle went off Maple Leafs defenseman Roman Polak in the slot and past Andersen. Hoffman made it 2-0 at 1:52 of the second period. Duchene carried the puck below the goal line and passed in front to Hoffman, who put it between Andersen’s pads. Pyatt’s goal at 16:55 of the third period. Anderson’s save on van Riemsdyk at 19:51 of the third period. Van Riemsdyk’s goal 54 seconds into the third period. Senators forward Mark Stone had a three-game point streak end (three goals, five assists). … Dumont’s goal ended a 35-game drought. His last goal came on March 13, 2017, with the Lightning. … Senators forward Alexandre Burrows got his 200th NHL assist. … Maple Leafs forward William Nylander had an assist in 19:25 and extended his point streak to four games. He has four points (one goal, three assists) during that span.